The Big Wobble: Earthquakes in strange places! A mag 3.9 strikes north-east England more than a 1,000 miles (1600km) from the nearest fault line. Earthquakes in strange places! A mag 3.9 strikes north-east England more than a 1,000 miles (1600km) from the nearest fault line. 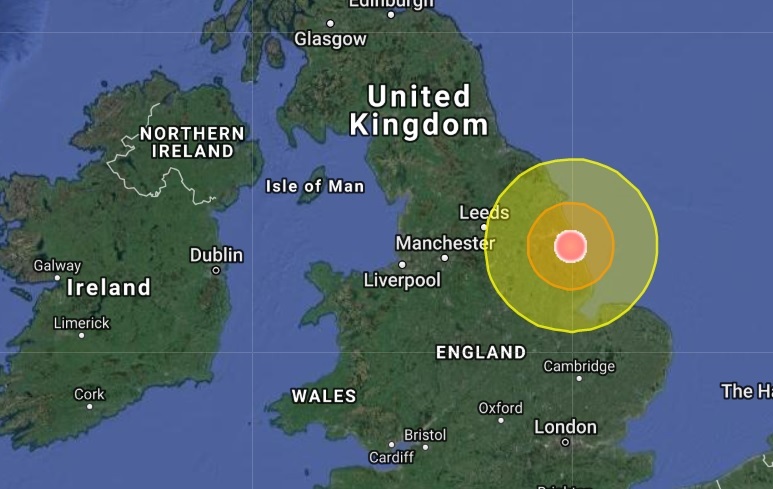 As the world enters its 23rd day without a major quake (mag 6+) a mag 3.9 strikes north-east Lincolnshire and was reportedly felt up to 60 miles (100km) away and more than a 1,000 miles (1600km) from the nearest fault line. People in the city of Hull were reporting feeling a tremor at 11.15pm on Saturday night. It is the second quake to hit Britain this year after a magnitude 4.4 in February struck the South Wales city of Swansea and was the largest earthquake on mainland Britain in almost 10 years, since the magnitude 5.2 ML Market Rasen earthquake on 27 February 2008. A magnitude 5.2 earthquake in 1906 was one of the most damaging British earthquakes of the 20th Century, with damage to chimneys and walls reported from Kidwelly to Cardiff. The British Geological Survey (BGS) said on Saturday, tremors were felt across parts of Wales and southwest England but no notable damage reported.